The Executive Inn and Suites is located few a blocks from Interstate 44. The Executive Inn and Suites is a new Hotel in Wichita Falls, Texas and is the ideal place to stay when you visit Wichita Falls for your family vacation or business travel. It is a great place to get away, and you will definitely enjoy the relaxation and serenity of the area. Our hotel provides affordable accommodations at great rates, and we provide a variety of modern amenities that every guest needs to relax during their stay and can start with our complimentary daily continental breakfast. All of the hotel rooms at our Wichita Falls hotel have plenty of space for a comfortable night’s stay. The Executive Inn & Suites provides the perfect accommodation for your Wichita Falls, Texas vacation. Our pleasant hotel is comprised of 60 magnificently decorated hotel rooms that provide luxurious bedding. You can choose from one king bed, two queen beds, and two double beds for your stay. Every guestroom is ADA Defined service-animal friendly. A wide range of amenities are available to guests while rooms are built with high ceilings and classic architecture. All of the hotel rooms are equipped with the highest quality amenities including air conditioning, iron, heater, sofa, hairdryer, free toiletries, private bathroom, telephone, cable channels, coffee maker, refrigerator, and microwave. You’ll be pleased to know that your pets are welcome at our Wichita Falls hotel. Take advantage of the free high-speed Wi-Fi throughout our hotel and every morning retreat with our continental breakfast. The Executive Inn & Suites is a pleasant place to stay if you are visiting Wichita Falls, TX for those who are visiting for family vacation or corporate stay without breaking the bank. For other services, guests can directly contact our around the clock front desk staff for assistance. All guests can park in the hotel parking lot free of charge during their stay. Our hotel is located right off of Highway 44 and close to a number of restaurants, bars, and Wichita Falls attractions. Nearby restaurants include Gutierrez family, The Gypsy Kit, Willie’s Place, Opa’s Schnitzel House, Hibiscus Cafe, Gyros & Kebobs, Short Stop Indian Restaurant, and 8th Street Coffee House. Popular attractions in the Wichita Falls area include Sikes Senter Mall, Lucy Park, Wichita Falls Museum of Art, Museum of North Texas History, Wichita Falls Memorial Stadium, Sunrise Optimist Fields, Kell House Museum, MPEC Center, and Wichita Falls Railroad Museum. Stay with us any time of the year where you’ll enjoy various festivals and special events. The Executive Inn and Suites hotel in Wichita Falls, Texas is conveniently located off Interstate 44 and just minutes from the local casinos. Free WiFi, parking, vending machine for snacks and drinks, laundry facilities, fax/copy sevices, and 24 hour front desk. Free and ample parking available in our hotel parking lot. 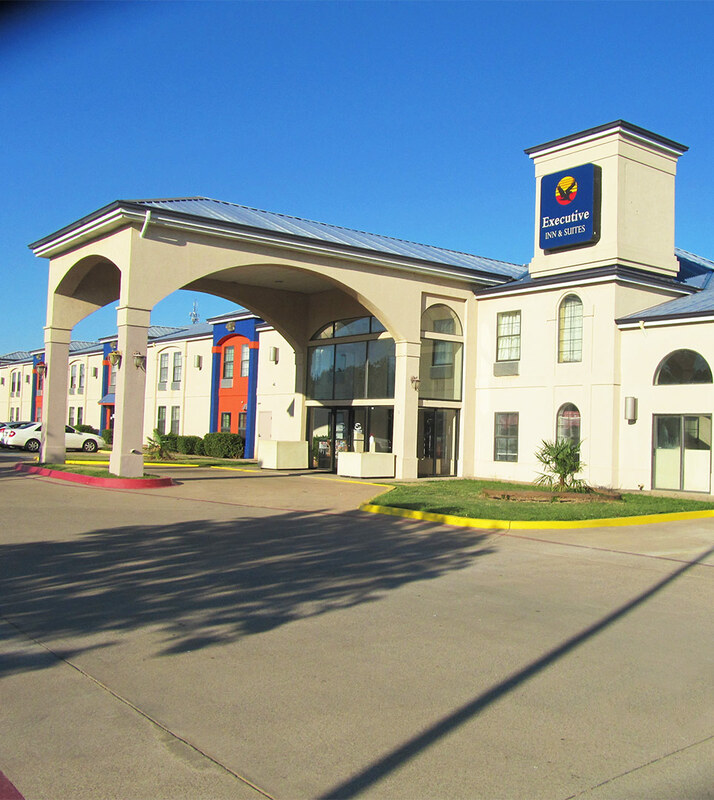 Free WiFi for all guests is available throughout the Executive Inn Wichita Falls, TX. Up to three children under 12 years stay free of charge when using existing beds. Additional adults are charged at $5 per person. ADA Defined Service Animals are welcome at our hotel. Pets are allowed upon request at Wichita Falls Executive Inn. Our Pet cleaning and sanitizing Fee: $10 per pet per night. Visa, American Express, Discover, Master Card. This hotel reserves the right to pre-authorize credit cards prior to arrival.